Led by our national friends and partners at GSA Network, #GSADay4GenderJustice and #GSADay4RacialJustice (in November and February, respectively) are days of action for GSA groups all across the country to mobilize towards greater justice for all and celebrate the multiple identities we hold. GSA’s are encouraged to host and organize teach-ins, teach-outs, rallies, marches, celebrations and other actions to raise awareness in their school and home communities. Genders & Sexualities Alliances are some of the first spaces LGBTQ+ youth find support, acceptance and, in many cases, an entry to activism in shifting the climate and culture of their school and home communities. And because this work is always more fun when in community with others, at the Alliance we try to connect GSA’s to other groups who are nearby. But we can’t help make these connections if you’re not signed up for the National Registry! So go register today! If you are a GSA advisor/sponsor or an adult ally in other LGBTQ youth spaces (such as a community center) and would like to be added to the Alliance's listserv to learn about events and resources, please contact our Youth Engagement Coordinator, Nat Duran. And check us out on Facebook! Are you planning an event and want to invite nearby GSA’s? Want to organize a district-wide action or campaign and need to get the word out? Just want to meet others who are nearby and in the movement for safer schools? 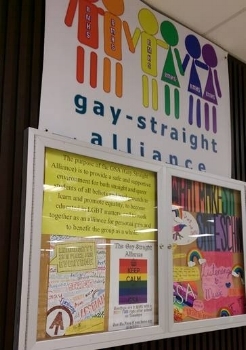 Relocating throughout that state and want to get a jump start in connecting to the GSA at your new school? This password-protected map can help you connect to GSA’s in your area and beyond! But your group won’t show up here if you’re not registered with the National Registry! Make sure you’re represented!